Coconut has a long history of use throughout the tropical world. Wherever the coconut tree grows, it is intertwined in daily life, culture, heritage and cuisine. 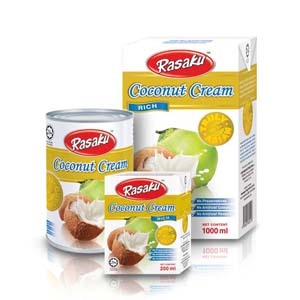 RASAKU offers a range of coconut related products: Milk, Cream, Cream Powder, Toasted Coconut Paste (Kerisik),Low Fat Desiccated Coconut, Coconut Water, Coconut Juice, Organic Virgin Coconut Oil and Coconut Cooking Oil. The finest mature coconuts are used as the basic raw material, delivering its full flavour and aroma. Our manufacturing processes are always under stringent hygienic conditions, and complies with international food safety standards. RASAKU products boast broad consumer appeal, with a distinctive taste suitable for all ethnic groups and ages. Our products have earned exceptional popularity in both domestic and international markets, and these easy-to-use products continue to grow in popularity. We utilize advance and innovative technologies, and combine these with modern packaging materials to lock in the natural flavour and aroma of coconut. These modern manufacturing technologies enable product shelf life of up to 36 months. RASAKU is available in all major retailers and is recognized internationally of for the authentic high quality products, consistent of quality, taste and aroma, while maintaining the natural goodness from its origin. Produced from freshly selected mature coconuts, Low Fat Desiccated Coconut (LFDC), is the dehydrated white coconut meat with a lower fat content. Desiccated coconut is made from the unsweetened fresh kernel of coconut, grated and oven dried (3% moisture content max.). It has a sweet aroma of coconut and comes in 50g packing size. Corn is widely known as a healthy and nutritious food, loved by people of all ages especially among the busy lifestyle group. Canned corn is convenient and most household would have them ready in their home. Rasaku Corn Kernel; picked and packed at the peak of its freshness to preserve the rich quality, crisp and sweet corn. It is 100% natural with no added colouring or additives which made it ideal for dessert, salad and also good on its own. It comes in 425g. Rasaku Cream Corn; is a type of creamed food made by pulping corn kernels and collecting the milky residue from the corn. It is an almost soupy version of sweetcorn, but unlike other preparations of sweetcorn, creamed corn is partially puréed, releasing the liquid contents of the kernels. Sugar and starch may be added, and homemade versions may include some variety of milk, perhaps even cream. Cream corn is widely used in desserts and comes in 425g. Rasaku Organic Virgin Coconut Oil comes in 2 sizes: 280ml and 500ml.